Map of January 18, 2019 snowfall. In a winter short on snowstorms (through mid-January), the southern quarter of Minnesota picked up a healthy blanket of snow on Friday January 18, 2019. Heavy snow moved out of South Dakota on Friday morning and set up a nearly stationary band, running along and south of the Minnesota River in western Minnesota, and extending from northern Iowa up into the far southern Twin Cities area. 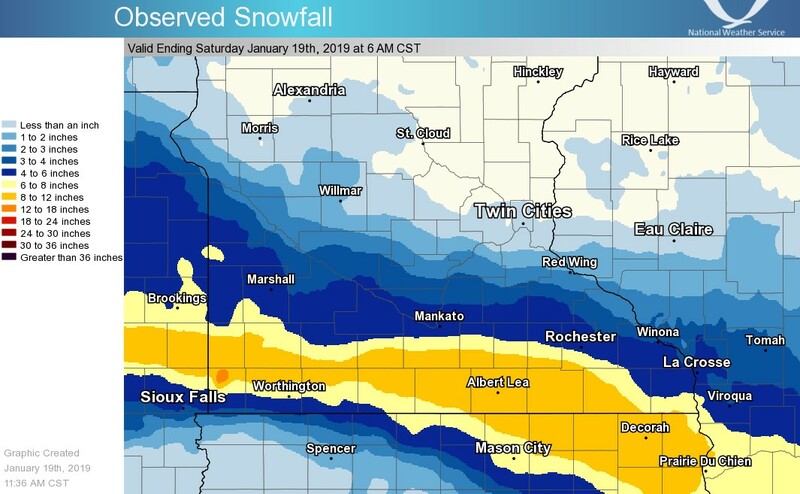 Accumulations were greatest along and near Interstate 90 in far southern Minnesota, where totals of 6-12 inches were common. The highest estimated total was 15 inches near Heron Lake in Cottonwood County (southwestern Minnesota). Accumulations of 1 to 5 inches extended north of the heaviest snow, towards Marshall, Mankato, Northfield, right up to the 35-E and 35-W split in Dakota County. The following snowfall totals were collected and published by the Twin Cities/Chanhassen office of the National Weather Service. for their dedication. Not all data listed are considered official.